The Peabody Essex Museum (PEM) is a popular attraction in Salem, Massachusetts. Since 1799, it has kept over 1.8 million art and artifacts from all over the world, especially China. During the nineteenth century, the museum played a significant role in the trading network between Salem and China. It continues to have exhibits and cultural events related to the country today. One famous example is Yin Yu Tang. 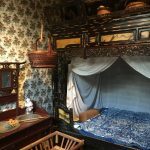 Yin Yu Tang is a house that was entirely shipped from China to the museum almost sixteen years ago. It was originally located in a village of Huang Cun, which is in Xiuning County of Anhui province. Anhui is in southeastern China. The home was built by the Huang family in 1800, and they and their descendants lived there for eight generations. They were a family of merchants but farmed as well. 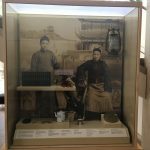 Towards the late twentieth century, most of the Huang family members left Yin Yu Tang and moved to other villages and Shanghai for better economic opportunities. Eventually, the house was uninhabited. During the mid to late 1990s, the Huang family decided to sell the house. Also, Xiuning County Cultural Relics Administration were looking for an American museum who would help preserve traditional Huizhou architecture. Luckily, they met Nancy Berliner, a scholar of Chinese art from the PEM. She was traveling in the area and kept revisiting Yin Yu Tang. 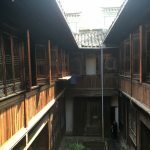 Because the house was for sale, both she and the Xiuning County Cultural Relics Administration agreed to relocate Yin Yu Tang to the PEM. For the next few years, the house was taken apart piece by piece and shipped to Salem. 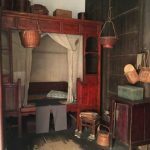 The museum was able to restore the house into what it looked like when the Huang family last lived there. Yin Yu Tang continues to be a popular exhibit at the PEM and it offers audio guided tours. Visitors love to check out what a old traditional Chinese home is like. As you enter the house, you see decorations with carvings of scenes from Chinese operas and animals. They were made to help protect Yin Yu Tang from bad omens. The courtyard has beautiful intricate carvings too, particularly the lattice windows. There are several images of dragons, which are important mythical creatures in Chinese culture because they symbolize imperial power. There are also carvings exemplifying peace and long life for the Huang family. On the contrary, some of the rooms are adorned with posters promoting Communist propaganda. 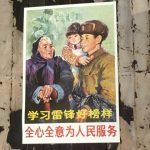 In the era of Maoist China, families were required to replace pictures of family ancestors with posters of Mao Zedong as a way of supporting him and the Communist party. If not, they would get in trouble by the government by being sent to ‘reeducation camps,’ prison, or they were executed. 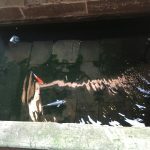 Other fascinating features in the courtyard are its stone fish ponds. They both have colorful koi fish, typically found in Chinese gardens. In the house’s heyday, the family used the stone fish ponds for fish that would later be used for food. They principally cooked the fish for special occasions like weddings and New Years celebrations. As of now, the koi fish are exclusively used for decorative purposes but they are worth watching. You are not allowed to feed them though. Visitors have a chance to go inside some of the bedrooms. One of them was where the master of the house and all of his immediate family members slept. It is impressive to know many people slept in a pretty small room with only one bed. I wonder how they all managed to do it. Although the bedrooms downstairs are embellished with Maoist posters, they have baskets hanging from the ceiling. One of them has clothing lying on the bed. The PEM surely does a great job making the house look as if the family still lives there. The bedroom upstairs is the one that stood out the most. It has features that are more Westernized and from pre-Revolutionary China. The room is festooned with European wallpaper and 1930s advertisements of glamorous Shanghainese pin up girls wearing flashy clothing and makeup. 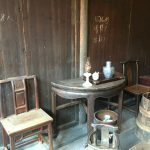 It is unbelievable this room survived the Cultural Revolution, a time when Chairman Mao wanted to rid China of anything related to Western culture and its pre-Communist past. Some of the other rooms shown at Yin Yu Tang are its meeting areas and kitchen. The meeting areas were where the family gathered. They would either chat, play mahjong (a traditional Chinese game), and prepare foods. They would also use one of the meetings areas to pray to ancestors and Kuan Yin, the Buddhist goddess of compassion and mercy. In fact, the house has an altar dedicated to the goddess, with a porcelain figurine of her. The kitchen is neat to look at as well. When the family lived at Yin Yu Tang, their kitchen had no electricity. Thus, they heated their stove with wood and fire. In this day and age, kitchens tend to be electric so I am curious to know what it must have been like to cook with no electricity. It most likely took the family a while to heat up their stove. On the other hand, I bet they cooked delicious meals because Chinese food is one of my favorite cuisines. Overall, Yin Yu Tang is a marvelous exhibit to explore at the PEM. Truth be told, I have gone to the house multiple times over the years. 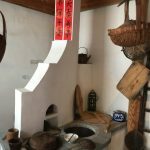 I always love learning about the Huang family and experiencing what a traditional Chinese home is like. It is almost like going to China without actually traveling there. However, I would love to visit the country someday. It is a destination with magnificent historical sites to see. 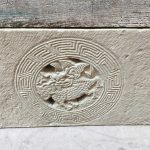 For more information on Yin Yu Tang, click here.